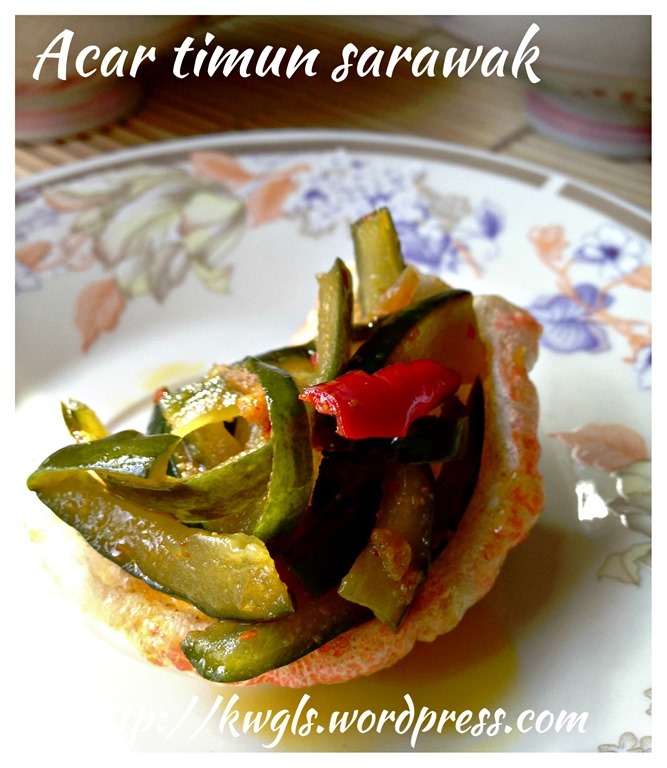 Sarawak Acar Timun or pickled cucumber is very different from West Malaysia’s Acar Awak or Nonya Acar..If as per Wikipedia’s definition, Sarawak Acar should belong to Malay Acar..
Sarawakian don’t usually eat Acar that was freshly prepared. It was preserved in vinegar and sugar for days, weeks or even months before it was served. 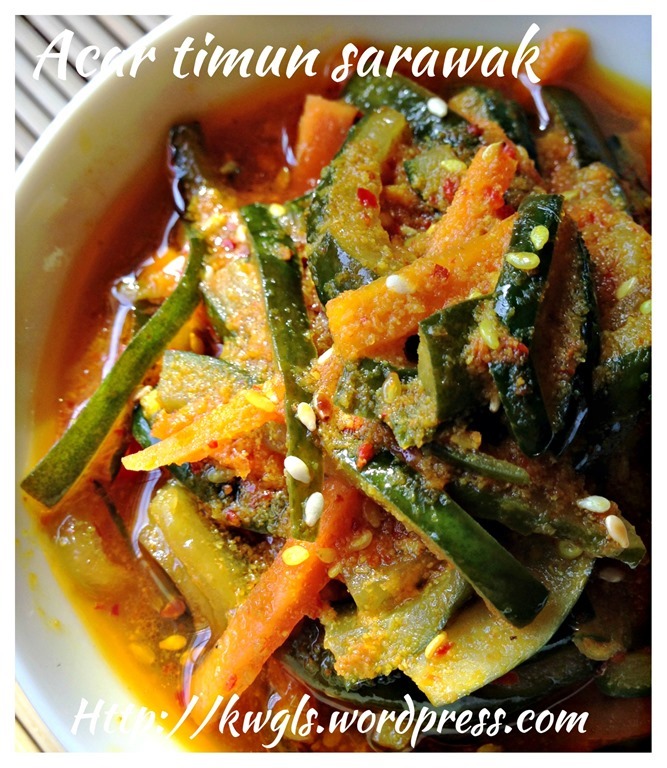 As such, the pickles are sweet and sour and full of turmeric and other spices flavour. The julienning of the cucumber are much thinner and longer than Nonya Acar and they usually do not have cabbages. The julienned carrot is usually used for purposes of adding colour to the Acar. 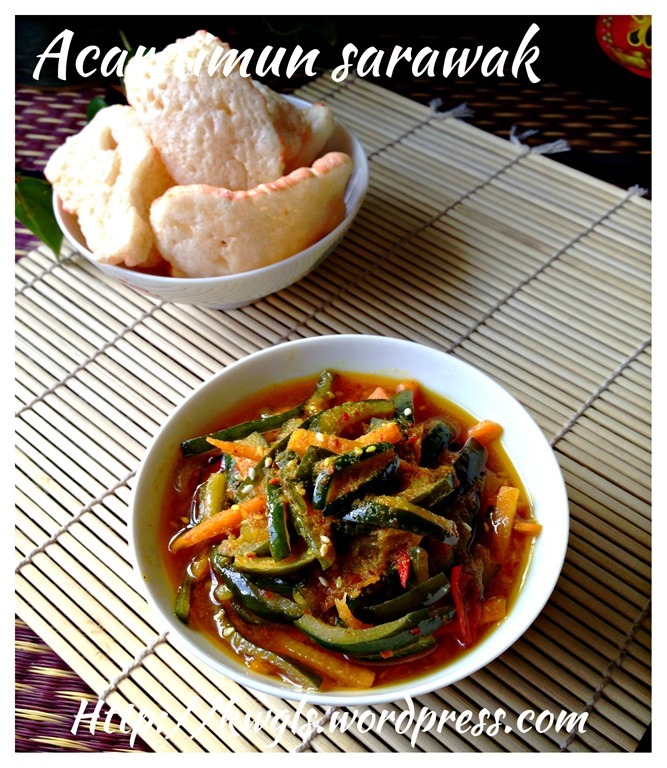 Another distinction of Sarawak Acar is that it was eaten with keropok or fish crackers…We do not eat Acar with rice… For Sarawakian Chinese families, Acar and fish crackers are the must haves during Chinese New Year…. 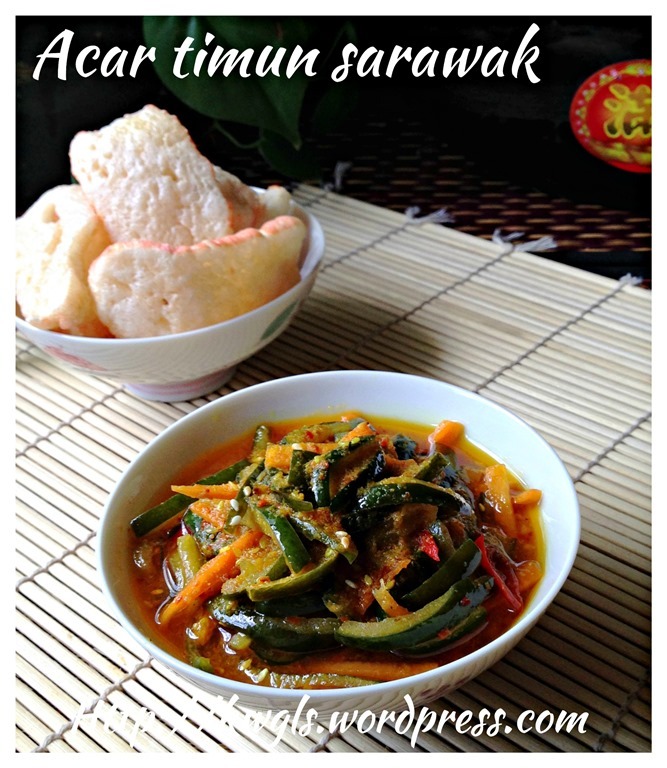 The keropok was usually served next to the Acar together with many other sweet cookies.. Is it not something rather unusual to serve savoury dishes together with cookies? I do not know the answer either but it is definitely very appetizing after eating too many sweet cakes and cookies. 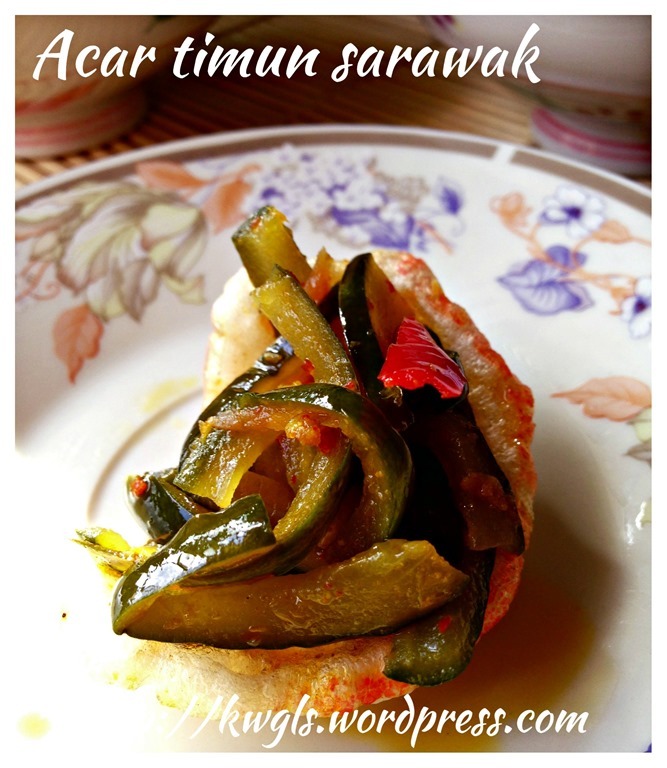 As usual, for many Sarawakian traditional cuisines, there are not many recipes in the internet. I really have a hard time of finding one be it in Bahasa Malaysia or English. I can only find one slightly more detail recipe that I used it as a basis of my Acar preparation. 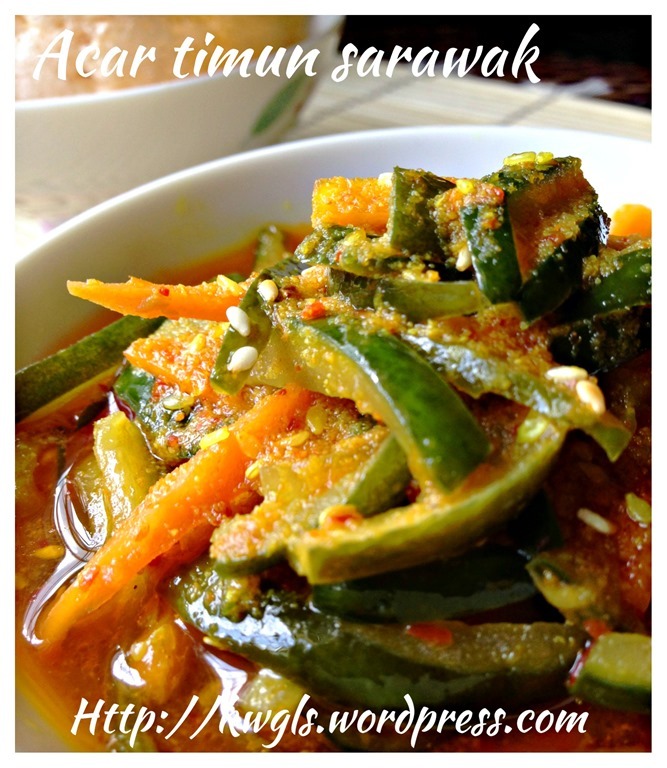 I am generally satisfactory with the Acar that have been prepared especially the taste. However, the colour of the Acar looked much lighter than what I used to eat. I have no idea what went wrong and I believed it may be due to the use of candlenuts or buah keras in the recipe (original recipe used macadamia nuts). In my next attempt, I will not use buah keras since buah keras is not something very common in Sarawak traditional cooking. However, for the recipe, I will list it as an optional ingredient. Julienne the cucumber into about 3mm x 3mm x 8cm matchstick size. Do the same for the carrot. For the cucumber, cut away the centre seeded part . 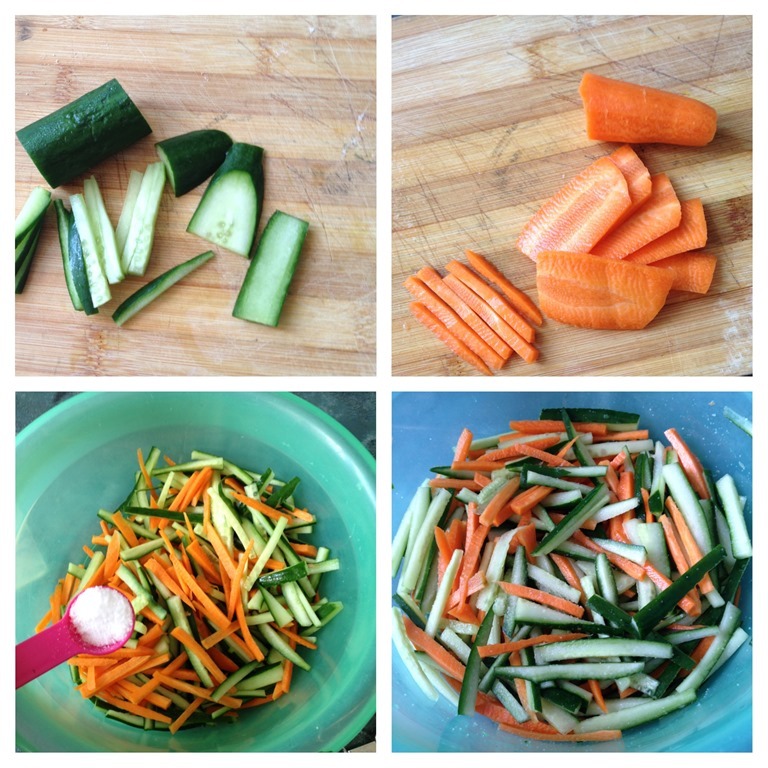 Sprinkle the cut cucumber and carrots with salt and toss until well mixed. Let it marinate for at least 1-4 hours. In this process, you will witness osmosis happen and juices will be secreted leaving some soft but crunchy cucumber and carrots. Before adding to the spice, these water need to be drained out by squeezing the cucumber. 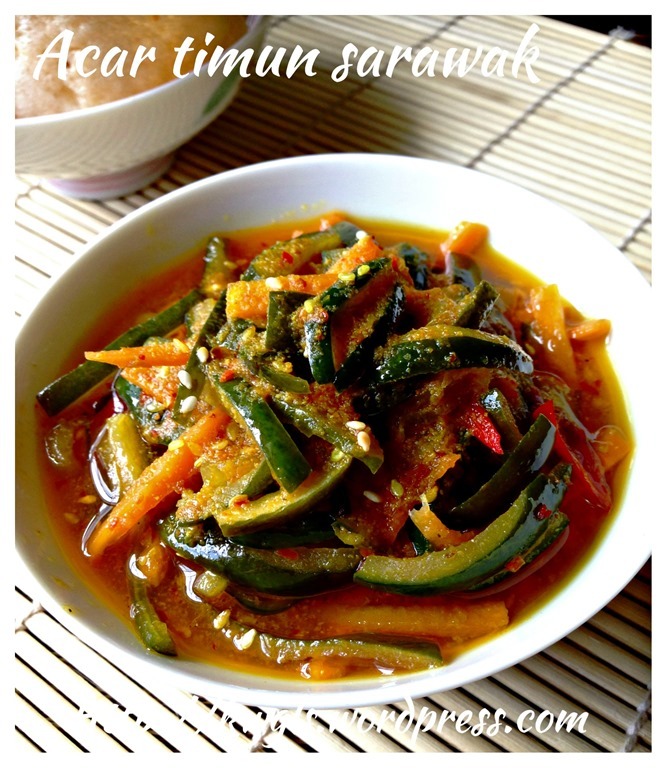 If prefer, you can also dry it under the sun for 1 day before preparing the Acar. Cut the chilli into long stripes about the same size as the cucumber and set aside. Put all the ingredients marked with “*” into a blender. Add a small amount of water and blend until fine. In a wok or frying pan, add the oil, transfer the blended spices to the oil and sauté the spices under medium heat until fragrant and oils have separated. Add the cut chilli, Acar (remember to squeeze all the juices out until as dry as possible) and stir fry for about 1-2 minutes until well mixed. Add sugar and sesame seeds. Stir fry until well mixed. Transfer to a sterilized container, add adequate vinegar to cover the vegetables. 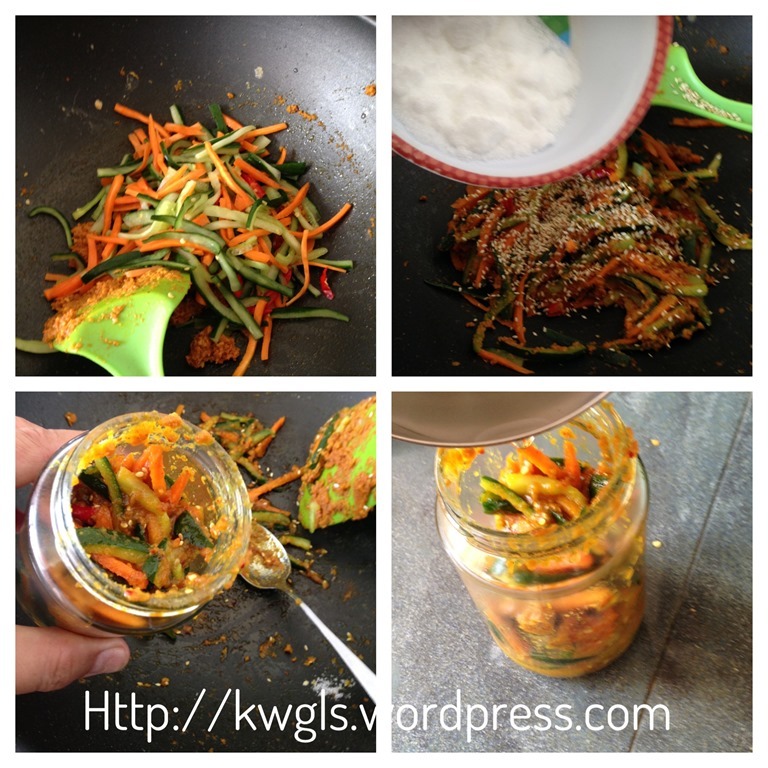 close the lids only when the Acar is completely cooled. Served after resting for 1-2 days. The above procedures have slightly stir fry the cucumber to make it slightly soft. 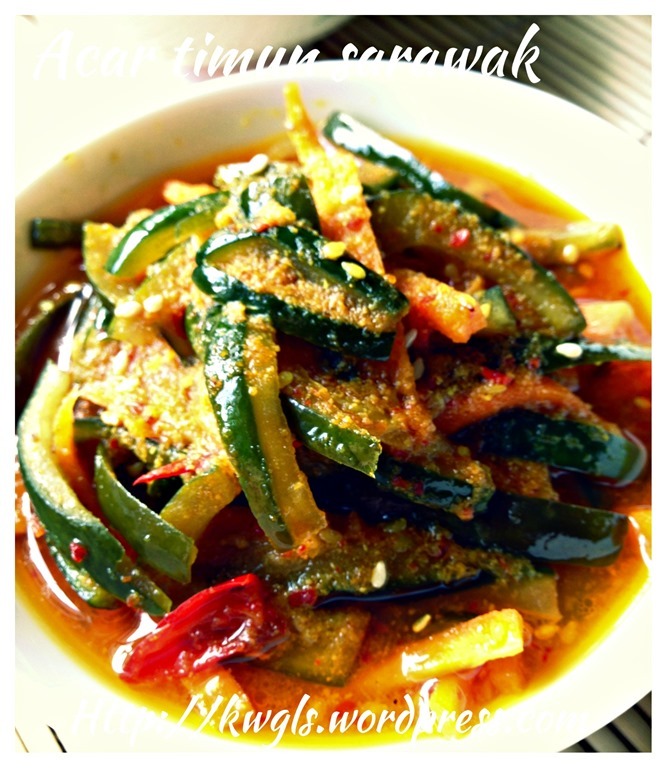 But the stir frying shall not be too long so that the cucumber maintain its crunchiness. Another alternative is not stir frying the vegetable. Once the rempah or mixed spice is done, add sugar and vinegar. Let it cooled completely before adding the marinated cucumber and carrots. Topped with sesame seeds. I will try out this method in my next attempt. If you are looking at Nonya Acar, I will issue another separate post. 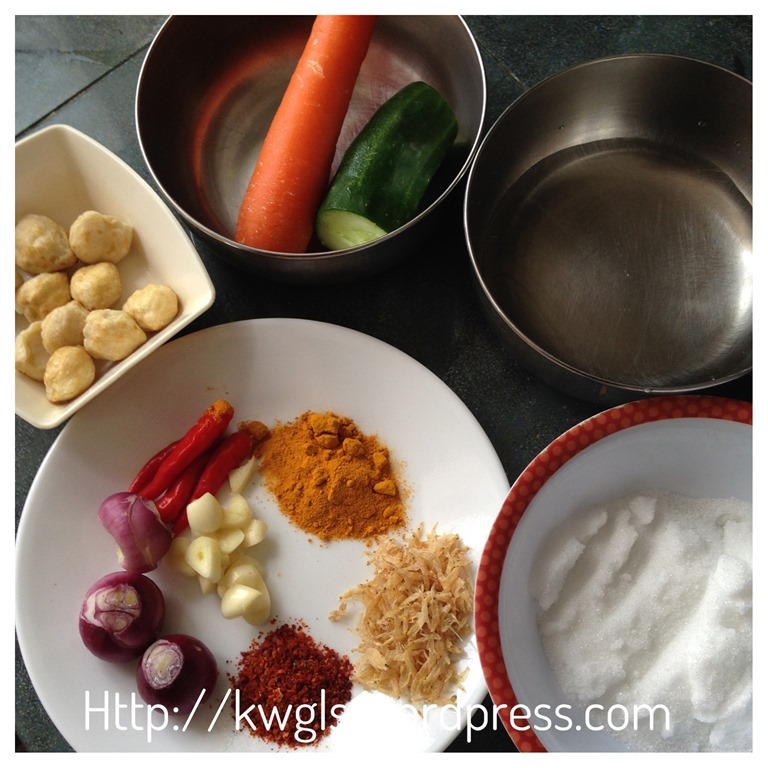 But you can use the above spices as a basis but with the following differences: (1) Cut thicker and shorter: (2) no need to marinate with salt, if you wish, just marinate for less than 1/2 hour; (3) Stir fry it lightly and add vinegar and sugar to taste. (4) Serve immediately. (5) Can add cabbages and long beans but it must be blanched in hot water first. 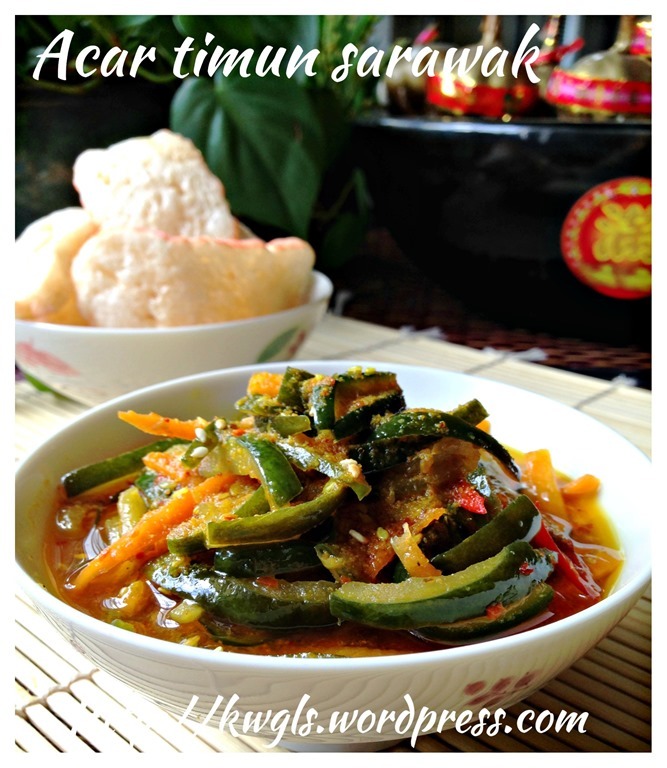 It is very likely that I will be preparing the Acar at a date nearer to the Chinese New Year. Should I have any better recipes or method, I will update the blog and shared with all. 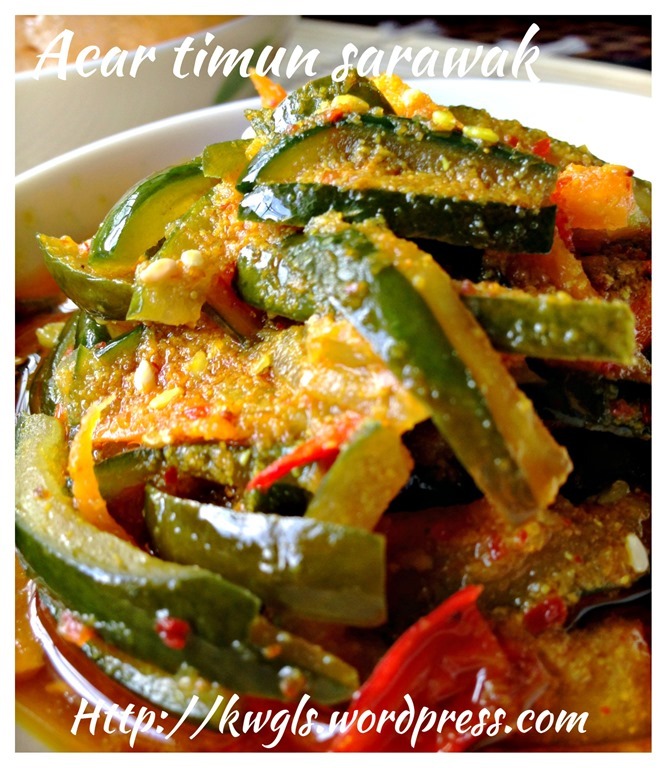 This entry was posted in Chinese New Year 2014, Food Preparation Series, Sauces and Pickles and tagged 8, Acar, Acar awak, Acar Rempah, Acar Timum Sarawak, Achar, Guaishushu, kenneth goh, nonya acar, pickled cucumber, postaday, Sarawak pickled cucumber. Bookmark the permalink. if there any alternative way to dry the cucumber and carrot beside sun dry? Can try to marinate with sugar and air dry in the fridge. It may help. IF u want to keep the ACAR for a long time, its not advisable to put in the fridge. Somehow water will be lock in and may cause the ACAR to go bad. Maybe keeping in very tight containers will help but not worth to waste all those efforts..hehe. My method for years of doing ACAR is…putting the cucumbers(only cucumbers, carrot no need) in a clean muslin bag or cloth bag, then use heavy weights(I used bricks…easier to remove, some people use pail of water) over them. Let the weight on the bag for 1hour(depends on how much cucumber & weights u have) and checking on them half hour to turn the cucumbers.Be careful of putting it too long else super dry. If again, u don’t think its dry enough….can use the hair dryer to blow any excess moistures. Walak…..u have crunchy cucumber! Any reason for using Japanese cucumber instead of the regular one?also to airdry the vegetables in fridge, should we do it after draining the fluid from the salted vegetables? No. Actually, I use Japanese cucumber because the centre seeding area are lesser. 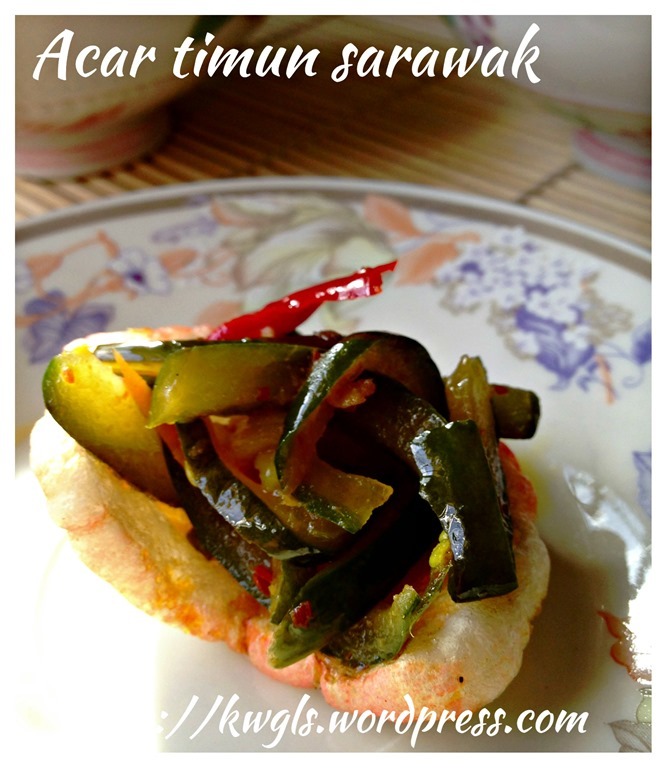 But I regretted as the taste is not as good as the traditional timbun we used. Hi there…was comparing reading your ACAR. 🙂 . 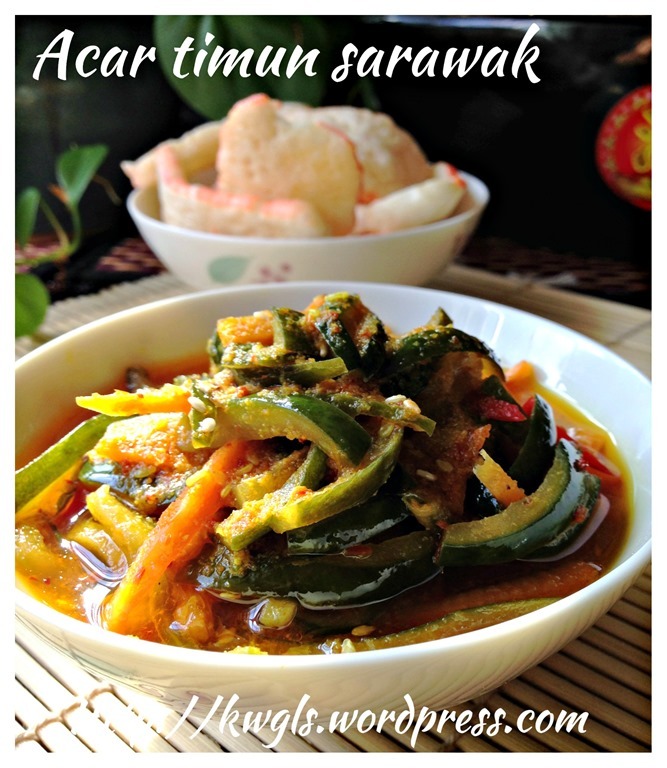 If not mistaken, I think u forgot to fry the dried prawns till fragrant, set aside and add last to the acar. That’s the secret of nice ACAR I think else something will be missing. 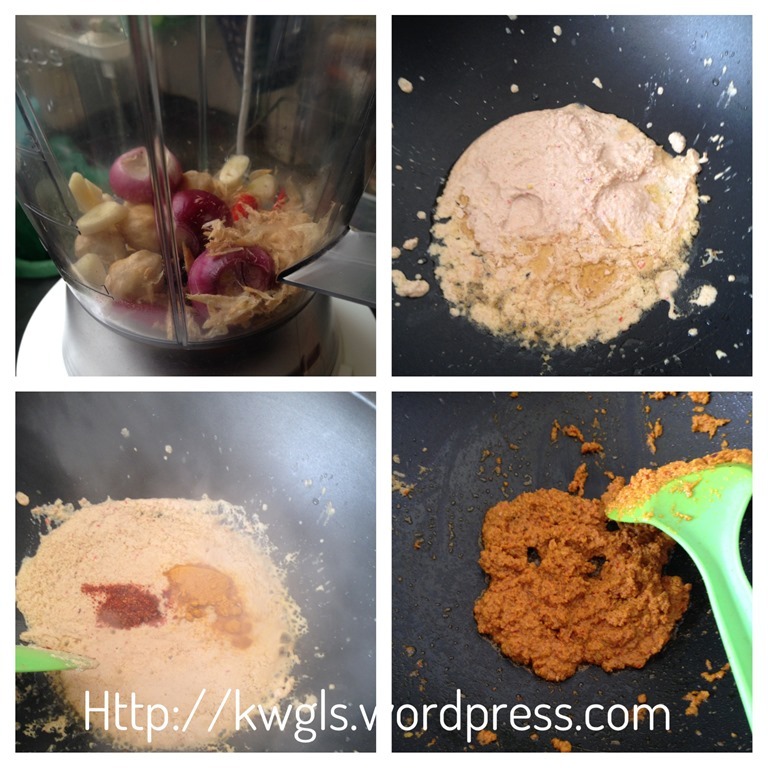 And for suggestion…can add coarsely pound peanuts to the acar. Will taste heavenly. Thanks you very much for your sharing. much appreciated.